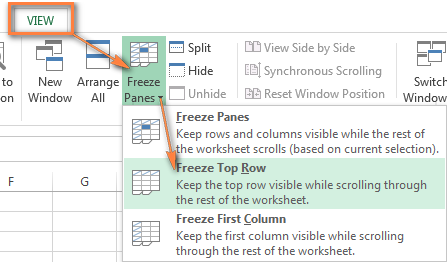 The tutorial demonstrates quick ways to freeze panes in Excel. You will learn how to quickly lock header row or/and the first column. You will also see how to freeze several panes at a time to make Excel always show certain rows or/and columns when you scroll down or right. These tips work in all modern versions of Excel 2016, 2013, 2010 and 2007. As you probably know, the recent versions of Excel 2016, 2013 and 2010 allow using more than a million rows and over 16,000 columns per sheet. Hardly anyone will ever use them to the limit, but if your worksheet contains tens or hundreds of rows, the column headers in the top row disappear when you are scrolling down to view lower entries. The good news is that you can easily fix that inconvenience by freezing panes in Excel. In Microsoft Excel terms, to freeze panes means to always show certain rows and/or columns at the top of a spreadsheet when scrolling. Bellow you will find the detailed steps for Excel 2016, 2013, 2010 and lower versions. Typically, you would want to lock the first row to see the column headers when you scroll down the sheet. But sometimes your spreadsheet may contain important information in a few top rows and you may want to freeze them all. Below you will find the steps for both scenarios. If you are working with Excel tables rather than ranges, you do not really need to lock the first row, because the table header always stays fixed at the top, no matter how many rows down you scroll in a table. If you are going to print out your table and want to repeat header rows on every page, you may find this tutorial helpful - How to print row and column headers of Excel. Do you want to freeze several rows in your spreadsheet? No problem, you can lock as many rows as you want, as long as you always start with the top row. Start by selecting the row below the last row you want to freeze. For example, if you wish to lock the top two rows, place the mouse cursor in cell A3 or select the entire row 3. Head over to the View tab and click Freeze Panes > Freeze Panes. The result will be similar to what you see in the screenshot below - the top 2 rows in your Excel worksheet are frozen and will always show up. Note. If some of the rows that you wish to lock are out of view when you apply freezing, they won't show up later, nor will you be able to scroll up to those rows. 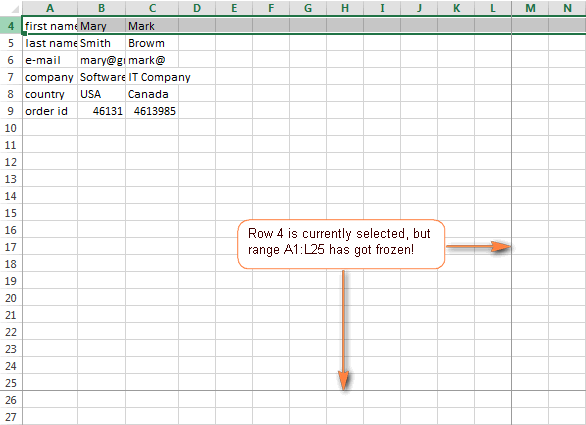 See how to avoid frozen hidden rows in Excel. You lock columns in Excel in exactly the same way as you lock rows. And again, you can choose to freeze the first column only or multiple columns. 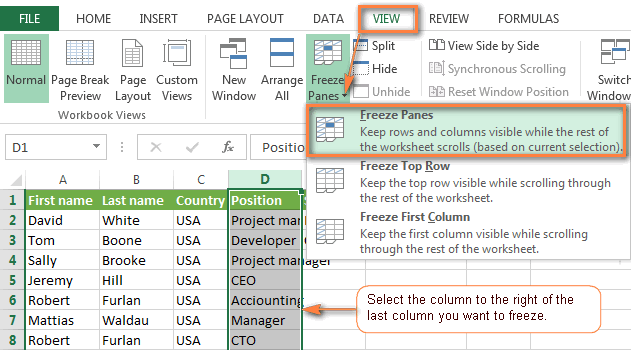 Freezing the first column is as simple as clicking View > Freeze Panes > Freeze First Column. A little darker and thicker border to the right of column A means that the left-most column in the table is frozen. Select the column to the right of the last column you want to freeze. For example, if you want to freeze the first 3 columns (A - C), select the entire column D or cell D1. Just remember that frozen columns will always start from the left-most column (A), it's not possible to lock several columns somewhere in the middle of the sheet. And now, follow the already familiar path, i.e View tab > Freeze panes > and again Freeze panes. Note. Please make sure that all the columns you want to lock are visible at the moment of freezing. If some of the columns are out of view, you won't see them later. For more details, please see How to avoid hidden columns in Excel. Do you wish to lock multiple rows and columns? No problem, you can do this as well, provided that you always start with the top row and first column. To lock several rows and columns at a time, select a cell below the last row and to the right of the last column you want to freeze. To unfreeze panes, just do the following: go to the View tab, Window group, and click Freeze panes > Unfreeze Panes. 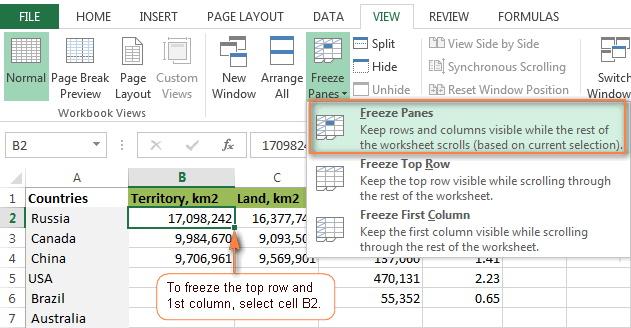 As you have just seen, freezing panes in Excel is one of the easiest tasks to perform. However, as is often the case with Microsoft, there is much more beneath the hood. What follows below is a caveat, an artifact and a tip. When you are locking several rows or columns in a spreadsheet, you may inadvertently hide some of them, and as a result, you won't see those hidden panes later. To avoid this, make sure that all the rows and/or columns you want to lock are within eyesight at the moment of freezing. For example, you wish to freeze the first three rows, but row 1 is currently out of view, as shown in the screenshot below. As the result, row 1 won't show up later and you won't be able to scroll up to it. Though, you would still be able to get to the cells in a hidden frozen row using the arrow keys. Don't you believe me? Then try selecting cell A1, or the top visible row, or the leftmost visible column, click Freeze Panes and see what happens. So, please remember, the panes you are going to lock, both rows and columns, should always be in sight. 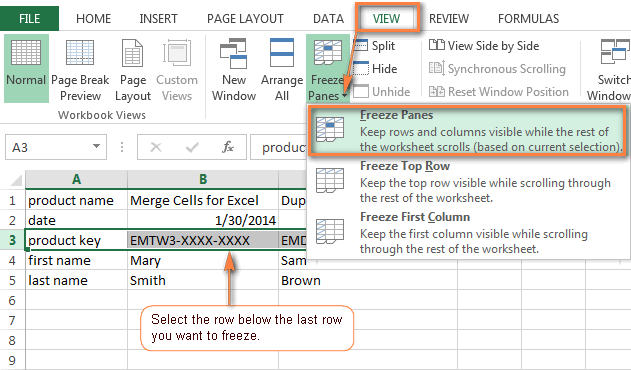 If you think this is something that might work for you, please see the following article for step-by-step instructions - Dealing with Excel Freeze Panes Line. And this is all for today, thank you for reading! 59 Responses to "How to freeze panes in Excel to lock rows and columns"
Your solution under "Artefact: Excel may freeze panes totally different from what you expected" helped me. Thanks a lot. I'm glad to know that, thanks for your feedback! I need a help in Excel,I am not sure if this is the right forum that would help. I would like to create a percentile bar chart in excel. Can I attach my excel example? A table has 10 values. In these 10 values 6 values are positive and 4 are negative. I need to create a chart, that shows percentage of positive values as bar chart. If this is not the right forum, please let me know where can I find an answer to such questions. I understand your task, but it does not relate to the topic of this article in any way. You can try finding a solution on some Excel forums like excelforum.com or stackoverflow.com. Thanks a lot for this post! Been looking for a detailed procedure for so long now! Help me freezing the panes.. I have 3 tables in a single sheet, with headings on different rows and have different colomns. How can I custom freeze panes for each particular table on a single sheet ? so that heading on each of the table shows up, while browsing the rows on individual table ? THX A LOT...THE INFO AND THE EXAMPLES ARE USEFUL AND EASY TO UNDERSTAND. Thanks for the information. It is very useful, it helped me. My problem, also. I have used excel since it came on the market and I switched from Lotus123, if I remember correctly. But every time I post this problem I get the same lecture on how to freeze rows like I was born yesterday. I have other spreadsheets with the top row frozen. But, even in those sheets the "freeze" icon is no longer highlighted. Also, the fonts are huge even though it is set on 8. The worksheets from previous years are the right font 11. If I have caused this problem on my Windows 10 will someone please tell me how to activate my freeze icon? Clicking on "normal" view does nothing. Sure, just select a cell below the last row and to the right of the last column you want to freeze and click Freeze Panes. This example shows freezing the first row and the first column. Thanks svetlana,your comment is very useful for me in multi-column freezing..
Thnx Problam Solved ! ! ! I don't have a "freeze" button!! Is there another name for it?? In Excel 2013 and 2010, the Freeze Panes button is on the View tab. What Excel version do you use? I am successfully able to freeze the top row. I do so and then save. However, each time I open the spreadsheet I have to manually re-freeze the top row. The save will not stick? Is there any way to permanently freeze the top row so I do not have to do so each time I open the sheet? Thanks in advance. I had the same problem, it was really frustrating! I couldn't find an answer anywhere! I've found that for some reason the default file type had been changed to an opendocument spreadsheet but when I changed it to save as an excel workbook it worked fine. I've no idea why this happened but at least it works now! I hope this helps! I am having the same problem since upgrading to MSO 2016. My document is already a .xlsx document. Is what you are talking about somewhere else? I think this is not possible, at least I don't know any way. HOW CAN TWO DO ROW OR COLUMN FREEZE PANE IN EXCEL SHEET. Hi, I want to freeze first 2 columns and then at the same tym 8th and 9th column and again 13th and 14th column. IS it possible? It's not possible to freeze multiple non-adjacent columns in Excel. You can freeze only adjacent columns and rows. Хочу сделать так чтоб прокручивая вниз в А1 отображался текущий месяц который уже прокрутил под замороженную строку. К сожалению, с помошью формул невозможно отследить скроллирование документа, это можно сделать с помощью VBA кода, но и там нужно будет потрудиться, чтобы отследить все варианты. Благодарю за ответ. Будем пытаться сделать. Is it possible the we freeze custom rows, for e.g freeze row#5, then row#9 then row#15. Nope :( Excel allows freezing only adjacent columns and/or rows. Best solution I've found all day!! Thank you so much!! This step was useful to me. I needed to freeze both rows and columnsat the same time. Thanks. Thanks for Good Article. I have a doubt in excel i hope you will help me.i have data in excel 2013 i want to learn how to sort it as i wish . When i have conditional formatting and freeze panes some of the formatting in the frozen panes does not refresh appropriately, is there a way of resolving this issue? Hi, I'm trying to freeze rows and columns at the same time, but can only seem to be able to freeze one or the other. Is it possible ot be able to freeze rows 1&2 and columns A B C & D? I want to freeze only the first row and first column. When I select those and freeze them it also freezes the nex 5 rows and 2 other columns. How do I get it to only freeze the first row and first column together? Please make sure that the first row and first column are within eyesight (above the scroll), select cell B2, and then click Freeze Panes. I've tested this on a few sheets in different Excel versions, and it always works. Thanks for this. Microsoft took something that was simple to do in previous versions of Excel with a slider and made it more complicated. When I select View - Freeze panes there is no extra Freeze panes as indicated in teh instructions to select more than one column/row. Used to work OK - but no longer. Only options that come up from Freeze panes refer to the first row/column ONLY - or unfreeze - sigh. 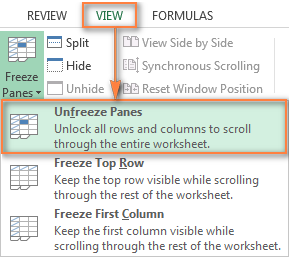 Excellent explanation on "How to freeze panes in Excel to lock rows and columns" in this article. Awesome, the examples helped. Thanks! i need to freeze 1st three columns how it is possible? Select the 4th column (D) and click the Freeze Pane button like shown in this example. Any possibilities to freeze multiple row which are not adjacent? e.g. : The "title" (rows 1:3), followed by sub-titles for individual tables on the same page (row 6:7, 23:24, 41:42, 58:59, 74:75). As you scroll down the page, the sheet allows you to scroll to each title then title automatically freezes and the page continues to scroll. In the end, you can see all of the frozen titles/rows, and can continue scrolling to infinity. hello, please advise me how to convert DAYS:HOURS:MINUTES to total number of days. how can we freeze column and row in same sheet on our choice not first row nor first column i want to do freeze 3rd row and 4th column in on sheet. please help to do that i waiting your answers. tayyab mirza from pakistan.